Capstone builds Michelman-Maruyoshi Chemical joint venture, , Maruyoshi Michelman Co. Ltd. Given the excellent long-term support Michelman has received from Capstone, we are already pursuing additional external growth initiatives together. 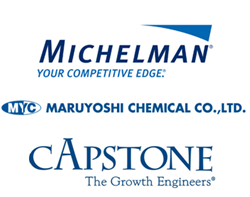 Capstone Strategic, Inc., a leading management consulting firm specializing in strategic growth, announced today that Michelman and Maruyoshi Chemical have entered into a joint venture, Maruyoshi Michelman Co. Ltd.
Michelman is a global developer of water-based coatings headquartered in Cincinnati, OH. Maruyoshi is a specialty waterborne polyolefin emulsions and chemical trading company located in Gifu, Japan. Capstone advised Michelman on this transaction and has supported Michelman on numerous other transactions since 1995. The joint venture will expand Michelman’s polyolefin emulsions business in the Japanese market while providing customers with new state-of-the-art solutions. Michelman’s team will provide strategic market development capabilities and experienced sales and technical support. Capstone is a management consulting firm located outside of Washington DC specializing in corporate growth strategies, primarily Mergers & Acquisitions. Founded in 1995 by CEO David Braun, Capstone has facilitated over $1 billion of successful transactions in a wide variety of manufacturing and service industries. Capstone utilizes a proprietary process to provide tailored services to clients in a broad range of domestic and international markets. For more information about Capstone and its growth strategy and advisory capabilities, please visit http://www.CapstoneStrategic.com. For timely commentary and insights into the M&A market, please visit the Successful Acquisitions blog at http://www.SuccessfulAcquisitions.net. Capstone can also be reached at 703.854.1910 or Growth(at)CapstoneStrategic(dot)com. Capstone is a management consulting firm located outside of Washington DC specializing in corporate growth strategies, primarily Mergers & AcquisitionsCapstone has facilitated over $1 billion of successful transactions in a wide variety of manufacturing and service industries.